The KTM Sungai Petani railway station is located in the state of Kedah in Malaysia, along the North - South, West Coast Railway Line that runs from Singapore / Johor Bahru, the capital Kuala Lumpur and the northern most station on the border with Thailand at Padang Besar. Sg. Petani is a major stop on this line and is served by regular Komuter services for short journeys, as well as the fast long distance ETS services. There is now a new Komuter Train Service operating between Padang Besar Station and Butterworth Station in Penang. There are many services in each direction a day, offering a good, cheap way to travel by train to / from Sungai Petani. 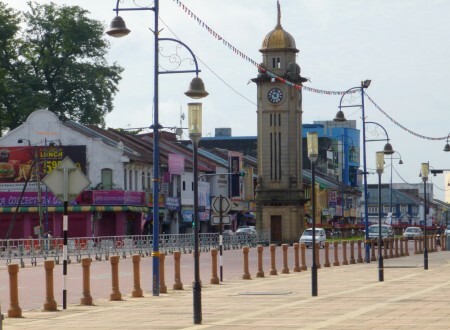 Tasek Gelugor, Bukit Tengah, Bukit Mertajam, Butterworth (for ferry to Penang Island - George Town). Gurun, Kobah, Alor Setar, Anak Bukit, Kodiang, Arau, Bukit Ketri and Padang Besar. At Bukit Mertajam, you can also change trains to travel further south to Padang Rengas in Perak by Komuter. The railway station at Sg. Petani has been rebuilt to accommodate the new high-speed electric trains (ETS) that started operating from July 2015 with a growing number of services stopping here. There are also regular KTM Komuter services operating throughout the day and evening for shorter journeys. The new train station is centrally located, just a minutes walk away over the tracks from the clock tower in the centre of the older part of town on Jalan Ibrahim (located to the rear of the station). If you want to travel from Sungai Petani to Thailand by train, we recommend you take a Komuter service to Padang Besar, then connect to a Shuttle service from there to Hat Yai. Once at Hat Yai station you have a choice of trains heading north to Bangkok, Hua Hin, Chumphon (for Koh Tao) and Surat Thani (for Koh Samui and Koh Phangan). The International Express Train that used to originate from Butterworth, no longer stops at Sungai Petani and now originates / terminates at the border station Pdg. Besar. So if you want to travel from Sungai Petani to Bangkok by train (or anywhere else on the Thai rail network), you will first have to take a Komuter or ETS to the border. You can use this train to get to many of the popular tourist destinations in Thailand, such as Hat Yai, Surat Thani (where you can transfer to the ports for boats out to the islands of Koh Samui and Koh Phangan), Chumphon (for boats to Koh Tao), Hua Hin and the capital, Bangkok. For shorter distances on the Komuter trains, you can buy your train tickets from the railway station on the day of travel. 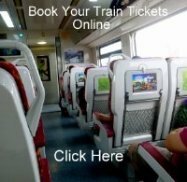 For longer distances on KTM ETS and Intercity / Shuttle services, you can pre-book your tickets either at a Malaysian Railway Station, or online from the KTM website or online ticketing agent. 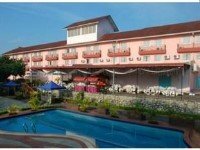 There are a number of good quality places to stay in town, some quite close to the railway station (the Seri Malaysia Hotel is just across the road from the main entrance). To read reviews and find the cheapest deals, just click on the picture / link below.